In an attempt to keep bringing you the best content possible, I was able to participate in a quick email interview with national baseball insider, Chris Cotillo, of MLBDailyDish.com. It contains a variety of topics ranging from the offseason of the St. Louis Cardinals to his busy life as a high school senior and baseball insider. Though he may still be in high school, he is one of the best baseball insiders and writers out there, so I am extremely thankful to have had this opportunity. stlCupofJoe: What are your thoughts on the Cardinals offseason thus far? With Peter Bourjos/Randal Grichuk, Jhonny Peralta, and Mark Ellis on board, Cardinal Nation is pretty pumped, so what’s a national media member’s thoughts? Chris Cotillo: I think they’ve had one of the more interesting offseasons in baseball this winter. As one of the best teams in the league last year, they didn’t seem like they had a lot to do, but still found a way to improve. I like the Bourjos trade, and Ellis is a nice complementary piece as well. The loss of Beltran will hurt them, and Peralta’s success may not be sustainable over all four seasons. Only time will tell, though. stlCupofJoe: Which of the three acquisitions will affect the team the most long-term? I have my opinion, which I’ve shared on Twitter, but would love to hear yours as well. Chris Cotillo: I think the Bourjos/Grichuk deal will be the best for them. Bourjos is a very underrated, good player…and Grichuk is not a throw-in by any means. Both of those guys have a legitimate chance to help the Cardinals at the big league level for a long time, and a guy who needed a change of scenery (Freese) and a throw-in (Salas) don’t seem like too hefty of a price to pay for them. stlCupofJoe: With the majority of the offseason checklist completed, do you see the Cardinals making any more complementary moves? Chris Cotillo: I think they are pretty much done for now. Small waiver claim/40-man roster shuffling moves always happen, but there are no glaring holes after the moves that they have made. stlCupofJoe: It appears that the final spot is down to Daniel Descalso and Pete Kozma. If you were in charge, who would you pick? Chris Cotillo: I would pick Descalso, just because of the versatility he can provide. Kozma may have some trade value because many teams are looking for help at shortstop. stlCupofJoe: As a soon-to-be high school graduate and national baseball insider, you’ve obviously got a lot on your plate. How are you able to handle it all? Chris Cotillo: I get about 4 hours of sleep per night, but I feel like I’m not accomplishing anything if I’m not awake, so I get used to it. I prioritize school over baseball writing, but if it’s a time-sensitive news item that needs to be written about, pre-calc or Spanish work can wait. stlCupofJoe: What is your favorite part of being a baseball insider? Chris Cotillo: Actually, just the competition part of it. I know that there are dozens of excellent reporters chasing the same stories as I am, so being able to get something first is something that I take pride in. I bet the thrill of the competition of getting information before others wears off after a while, but for someone like me who can’t hit a beach ball with a tennis racquet–it’s the closest thing to a sport as I can get. stlCupofJoe: As a Boston native, is it tough to stay as un-biased as possible while doing your job? Or do you still find the time to show your Red Sox pride? Chris Cotillo: It’s becoming easier. I root for people in the game who have been good to me and have helped me out, regardless of team or opponent. Being able to cover the World Series in October at Fenway, I was thrilled to see the Sox win just because I knew it meant a ton to a lot of friends and family members of mine…and the city needed it badly after what we went through in April with the bombing. It truly brought everyone together once again, but this time for something extremely positive. I may not be a diehard Red Sox fan anymore, but I am still a diehard fan of the city of Boston and everything it stands for. stlCupofJoe: I’m a Butler pharmacy student, but I also aspire to be a pretty respected baseball writer (which is why I started stlCupofJoe), what would be one piece of advice you would have for me? Chris Cotillo: My biggest thing is to not make up stories or claim that sources are telling you things when they’re not. You earn respect from other reporters by citing sources, showing that you have a passion for all of this, and by not making things up. 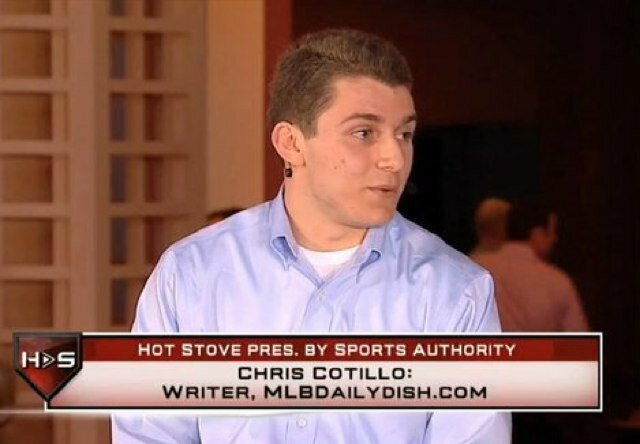 For the latest breaking news in the MLB, I highly recommend you follow @ChrisCotillo on Twitter. You can also read some of his top-notch articles on MLBDailyDish.com. He is one of the few national insiders that I follow on a regular basis, and I highly recommend you do the same. For more updates, follow me on Twitter: @stlCupofJoe or Facebook: stlCupofJoe’s Sports Page. The offense of the St. Louis Cardinals has struggled against left-handed pitchers over the past few years, and 2013 was no exception. Standard statistics show this pretty clearly. Against lefties, the Cardinals had a .238/.301/.373 slash line. For comparison purposes, the team hit .280/.343/.412 against righties in 2013–a statistically significant difference between the two. With left-handed hitters, Kolten Wong (second base) and Matt Adams (first base), set to play every day next season, it appears the team may be on its way to another poor season at the plate against southpaws. But Joe, what about your last post in which you said Craig needs to play first base, subsequently moving Adams out of the starting lineup? Well, my projected replacement for the vacated spot (by Craig) in the outfield was Oscar Taveras, yet another lefty bat. John Mozeliak (General Manager) and Dan Kantrovitz (Scouting Director) know that hitting lefties, for whatever reason, is a problem for the Cardinals. Do they have faith in both Wong and Adams to make the required adjustments to adequately hit left-handers at the big league level? Of course they do. However, they smartly added necessary insurance by signing a veteran right-handed hitting bat in Ellis. Ellis had a solid .282/.331/.412 slash line in 131 at-bats against lefties last season. If you include his 2013 numbers with the Cardinals’ numbers against lefties, it would have raised the team batting average three points–from .238 to .241. This may not seem like much, but one player can only do so much to influence a team’s overall average. In fact, it would have taken the team from 13th in the NL in batting average against lefties all the way up to the 8th spot in the league. Ellis is getting older. I get it. He will turn 37 in June next season, and we all expect age-related decline to be in full effect. A .282 average against lefties is a vast improvement for the offense of the Cardinals. However, as many baseball minds would ask, considering his age, was that a hard .282 or a soft .282? In other words, with one season (131 at-bats) being a pretty small sample size, was he lucky to have such a solid average? Were bloop hits falling in front of outfielders or were seeing-eye singles finding holes through the infield? The graph below (from BrooksBaseball.net) puts this notion to rest. Ellis, at the age of 36, was still smacking line-drives all over the diamond against lefties in 2013–especially on pitches in the outside portion of the strikezone. In 117 balls-in-play against lefties in 2013, 33 of them were line-drives. This is good for 28.2%. To break it down a tad further to accentuate a strength of his, Ellis’ LD% was an incredible 39.4% (13/33) on pitches in the outside portion of the strikezone. This implies an approach at the plate of “shooting the ball the other way”–an approach that will fit in quite nicely under hitting coach, John Mabry. 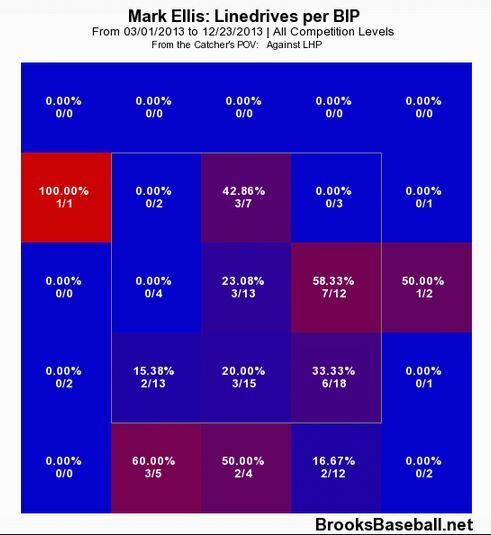 The top two overall LD%’s in 2013 were 29.8% by James Loney and 27.7% by Gregor Blanco/Joe Mauer. Thus, Ellis appears to be at the top of the league when it comes to LD%. Obviously, this only applies to his balls-in-play against lefties, but if things go as planned with Wong, the majority of Ellis’ at-bats will come against lefties. Will he stunt Wong’s development by participating in a full-on platoon at second? I sure hope not. I truly believe Mozeliak moved Freese in order to give Wong a spot in the starting lineup. However, Wong is just 23-years-old and has yet to participate in a full 162-game season. A 162-game season can be long and grueling on a player–especially a high-energy player like Wong. Ellis is the perfect complement second baseman for the rookie. He can give Wong days off (especially with a lefty on the mound) to preserve his legs for the duration of the season. Also, there is a still a pretty big part of the fan-base that doubts Wong’s ability of being an everyday second baseman. If he continues to struggle like he did in part-time action last season, Ellis will be primed and ready to fill in on a more regular basis. In short, the extent of Ellis’ playing time with the Cardinals is yet to be seen. However, it is nice to see that he is still hitting line-drives at a top-of-the-league percentage against lefties at this point in his career–a welcome addition to the offense of the St. Louis Cardinals. The 2014 St. Louis Cardinals and beyond need Allen Craig at first base. Before I lose readers, let me make this clear: this post is not meant to be a knock on the ability of Matt Adams or Craig’s defensive ability in the outfield. Will I take a look at their defensive numbers? Of course I will, but as you are reading, keep in mind that this is not the main point of the article. With four years and $28.25 million (not counting a $13 million team option in 2018) left on his current contract, it is in the team’s best interest to have the 29-year-old Craig on the field as much as possible. Sure, the team warded off the Pittsburgh Pirates for National League Central crown with Adams at first base, but if the World Series is any indication, Craig was sorely missed. As we all know by now, the 2014 projected lineup consists of Craig taking over Carlos Beltran‘s spot in right-field and Adams stepping in at first-base on a full-time basis. Craig’s UZR/150 in right-field last season? -24.3. To put this in perspective, Beltran’s was -18.7, and we all had some very strong opinions on his declining defense over the past two seasons. I understand that one season is a pretty small sample size so I dug a little deeper. In 627 right-field innings in his career, Craig’s UZR/150 sits at -5.6–making him “below average” at the position. At first base, Craig had a 3.3 UZR/150 in 2013 and is at 0.3 in just under 1,600 innings played at the position in his career. As Corey Noles noted back in July, Adams vastly improved his defense in 2013, but even at his best, he is an inferior defender compared to Craig. For those wondering, Adams’ career UZR/150 at first base (792.1 innings) is -1.9. To his credit, though, he was much improved in 2013 at -0.5 compared to -4.1 his rookie season. As you can see, the Cardinals’ defense is much better with Craig at first than in right-field. Obviously, as long as Oscar Taveras‘ health remains a huge question mark and until he proves he can perform at the big league level, they have no choice but use Craig in right. This was made apparent when Beltran left on a three year deal with the Yankees. However, despite these numbers and like I said in the first paragraph, my reasoning behind the Cardinals needing Craig at first has very little to do with Craig’s or Adams’ defense ability. Craig, a fan favorite for both his performance and his effort, plays the game 110%. Two of his major injuries are a perfect example of this. He fractured his knee cap crashing into the side wall at Minute Maid Park back in 2011. Last season, he injured his foot rounding first base trying to extend the play on an overthrow (to this day, I blame the umpire for being in his way). Were both injuries fluky? Yep, but if he is called upon to play 140+ games in the outfield in 2014, there is a pretty good chance he will get injured again. Craig was an All-Star last season, had one RBI every five at-bats, and hit .454 with runners in scoring position. 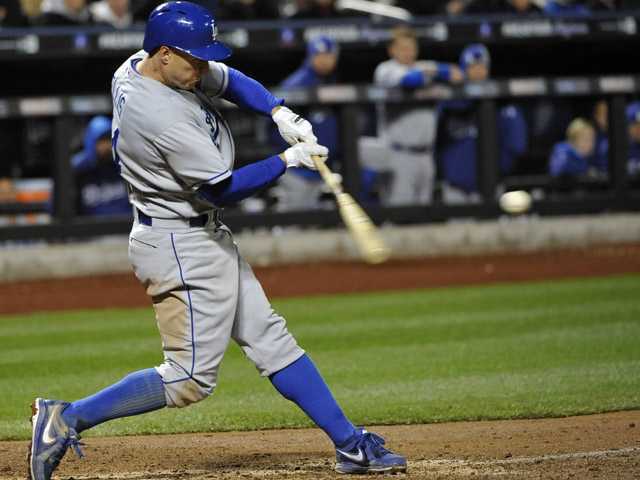 His foot injury left him out of live action for almost two months, yet he came back and did what he does best in the World Series–hit. In 16 at-bats, he had six hits. That’s incredible. He is the “Amazing Whacker Guy” after all. Adams is due for a breakout season. He will have more experience, he will get more at-bats, and he will be fully healthy. Corey Rudd of stlsportsminute.com wrote a detailed piece for the Yahoo! Contributor Network breaking down this belief. However, despite this, I don’t think I will have many people disagreeing with my following statement. A fully healthy Allen Craig is more important for the success of the Cardinals than a fully healthy Matt Adams. Could Adams prove me wrong in this statement? He sure could, but at this point in both their careers, it is hard to argue with the Craig’s resume. Could Craig still get hurt at first base? Yep, but there’s a much lower risk there than in the spacious outfield of Busch Stadium. Could the addition of Peter Bourjos lead to less range needed to be covered by Craig in the outfield? Absolutely! Bourjos has some of the best range in baseball, but the outfield walls will still be there, and I am fairly certain Craig will run into one or two throughout the course of the season. Sure, he could ease up on 50-50 balls, but that’s not the way Allen Thomas Craig plays baseball. The Cardinals gave him the five year extension because he not only plays the game at a high level, but he also plays it the right way–the Cardinal Way. In conclusion, do I want Adams’ bat in the lineup every day for a full season? You bet I do. However, I do not want it at the expense of Craig’s health. With Beltran gone, the Cardinals will ask even more from Craig next season. They need 550+ plate appearances from him. Can he get that while playing right-field all season? Yes, he could, but I like his chances of reaching that number much more if he played most of his games at first. Obviously, if set-backs occur with Taveras or he doesn’t perform the way the organization would like early in the season, this post won’t mean much. Yet, I still figured it was exploring because if he does perform the way many scouts believe he can, he will be an ideal fit in right-field for the long-term. I leave you with this. The 2014 ZiPS projections for Craig, Adams, and Taveras from ESPN’s Dan Szymborski. These only include offensive statistics, which wasn’t really the main point of this article, but I still figured they were worthy of being included in the post. I would love to hear your thoughts on the topic. Feel free to include them in the comments section below. With the St. Louis Cardinals pretty much done with their big moves this offseason, it has been pretty quiet for Cardinal Nation of late. Because of this, I decided it was a perfect time to bring you my third edition of prospects to watch for the 2014 MLB Draft. If you missed Part 1, you can find it here, and if you missed Part 2, then here you go. With both of the Cardinals picks later in the first round, I decided to forego talking about any of the “lottery prospects” per se. No need to get fans hyped up about a player that will almost certainly be unavailable by the time it’s the Cardinals turn. Now, I realize I wrote about some top prospects in previous posts, but that’s merely because I saw some mock drafts that had them falling back to later in the draft. I am taking a look at Hill because in Bleacher Report’s latest mock draft, they have the Cardinals selecting him with their 31st pick. According to a Baseball America post from last summer, Hill has top-class speed–both on the base paths and in the field. Based on the numbers (~6.4 second 60-yard-dash and 3.9-4.1 seconds from home to first), he would probably already be at the top of the organization in terms of outfield range–a welcoming sight given the Cardinals’ 2013 range in center field. 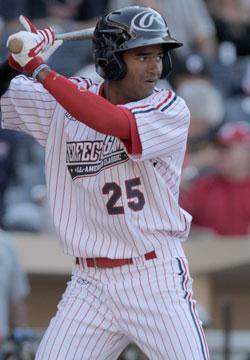 His arm is slightly above average which further cements him as one of the best defensive center fielders in the draft. Want video proof of his range? Check out this clip from YouTube. What a dazzling play–the play of the tournament. At the plate, this 6’1″ 175 pound righty packs quite the gap-to-gap punch. According to Baseball America, he has a short compact stroke, and he “rarely swings and misses.” A right-handed bat with speed who rarely swings and misses? Who doesn’t like the sound of that? Like Hill, I chose to write about Johnson because another site had the Cardinals selecting him in their mock draft. According to a post from Baseball America, this 6’4″ righty delivers quite a downward plane on his pitches despite having just a three-quarters arm slot. He is a quick and efficient worker who pitches to contact, but is also able to strike guys out when he needs to–largely due his deceptive arm motion. His fastball ranges from 89-91 MPH with late downward movement, but like Michael Wacha, it will likely increase as he develops his pitches and grows into his 6’4″ frame. His father, Dane Johnson, is a former major league pitcher known for his curveball. Well, like father like son, Cobi has quite the curveball of his own (check out the 38 second mark of that video for proof). Professional baseball is in his genes, and as a student of the game that is still growing physically, his future is very bright. Through the Fence Baseball has the Cardinals selecting lefty Medeiros in their latest mock draft. His profile on Perfect Game says it all, “Can flat out pitch! Unhittable and up to 95 at PG AA. Excellent breaking ball. Impressed at WWBA World Championship.” Need I say more? This lefty has an unorthodox motion (three-quarters dropping down to side-arm at times) with two plus pitches already in his arsenal. His fastball touches 95-96 MPH (watch his pitch sequence starting at 1:12 of that video…nasty!) and his sharp slider basically renders lefthanders useless at the plate. At just 6’0″, there are some doubts of his projectability as a big league starter, but with his devastating stuff that you cannot teach, the Cardinals would surely find a way to develop him. They seem to be pretty good at developing young pitchers don’t they? Baseball Draft Report has the Cardinals selecting Davidson in their latest mock draft. At 6’3″, 220 pounds, this left-handed bat has very good power potential. He’s got one of the most powerful swings in the draft that can be seen in this video (start watching video around the 1:35 mark). According to Baseball America, when Davidson makes contact, “the ball makes a different sound than that of other players as it explodes off his bat.” In a showcase over the summer in Minnesota, he deposited two long home run balls into the upper deck of the Metrodome. He admits that he swings and misses too much, but with time and development, I am sure he can cut back on this. I have not seen many defense reports about him which isn’t necessarily a good or bad thing. I have seen videos of him in the outfield and at first base, and it looks like he can handle both positions relatively well. However, like I made clear, he is known much more for his bat than his glove. Baseball America has him ranked 50th on their October MLB Draft preview. He led the Collegiate Team USA in hitting this summer. He can play either corner infield spot and probably has the power to project as a corner outfielder as well. Unfortunately, I couldn’t really find many reports on him nor any good videos. However, if Baseball America ranks him in their top 50, he is definitely worth keeping an eye on. He will likely be playing his last collegiate season this spring for the UC Irvine Anteaters. There you have it. Five more prospects for your reading/following pleasure. I now have taken a look at 15 MLB Draft prospects. With the Cardinals having two picks in the first round, let’s hope that one of the fifteen gets their name called by St. Louis so we know a little bit about them before draft day. It has been a while since I had a baseball post on here, and I really do apologize for that. Between school (final exams are next week) and the SEC Championship game (if only Mizzou’s defense had showed up), baseball had been on the back burner somewhat. However, to make it up to you, I was able to score a pretty informative baseball chat with one of ESPN’s top baseball writers, Dan Szymborski. The first three questions involve specific sabermetric statistics. As a fan and a blogger, I always wanted to know what statistics sabermetricians looked at first when breaking down players’ numbers. I realize they look at many more statistics than just one, but as fans, our minds are not always able to grasp the depth behind some of these statistics. Thus, I asked him his “go-to” statistic for the three major aspects of the game–hitting, pitching, and defense. I will now use these more in future blogs, and I hope you all will use them to better analyze players’ numbers as well. I followed with three questions involving the St. Louis Cardinals–one about Jhonny Peralta, one about the team going into 2014, and one about Carlos Martinez/Michael Wacha. I concluded the Q&A with a question about his job and any advice he would give to fans who take a look at statistics themselves. stlCupofJoe: Hitting: What is your single, go-to, most-inclusive statistic when comparing hitters? Dan Szymborski: I’m at risk of being declared an apostate and being thrown of the fraternity, but OPS+ is still an easy go-to statistic. It gets you most of the way there, it’s conceptually easy to grasp, and it’s been available and used for the right time. Communicating sabermetric ideas doesn’t necessarily mean the exact, most absolutely accurate, statistic. Dan Szymborski: FIP. Most predictive basic stat, though ERA+ for a more general audience. stlCupofJoe: Fielding: With DRS, UZR, UZR/150, RF/9 innings, etc., what is your go-to when comparing fielders? Dan Szymborski: If forced to choose one, it would be Sean Smith’s Total Zone, simply because we have those numbers historically. Now, I like to blend UZR/DRS and regress toward the mean. stlCupofJoe: What is your opinion of the Jhonny Peralta deal for the Cardinals? Dan Szymborski: I’m a big fan of the Peralta signing. It was a gaping hole for the Cardinals last season, one I didn’t think they had the proper motivation to fix, but they proved me wrong. The Cardinals are in WS Contention – it’s not smart for them to sort through guys like Greg Garcia and gamble on who works out. stlCupofJoe: A little projecting here, given full health (fingers crossed), which young phenom projects the best as a starter? Carlos Martinez or Michael Wacha. Dan Szymborski: Michael Wacha. Already *having* success in the majors is a big boost to future expectations. We’ve already seen Wacha be able to get major league hitters out consistently as a starter. We *believe* Martinez has a high chance of doing so, but he hasn’t done it yet. stlCupofJoe: What’s your favorite part of your job working over at ESPN? Dan Szymborski: The getting paid to write baseball part! I would’ve been quite surprised to be told 20 years ago that I would be a baseball writer for ESPN and not working a really boring job at a bank or an investment firm. stlCupofJoe: What’s one message you would like to tell fans who try to make sense of all the statistics involved in baseball? Dan Szymborski: The most important part of using stats is learning when *not* to use each particular stat. There are a lot of people out there that, while interested in modern baseball stats, don’t quite get the benefits and downsides of each of those statistics. Thank you so much for the time, Dan. It means a lot. 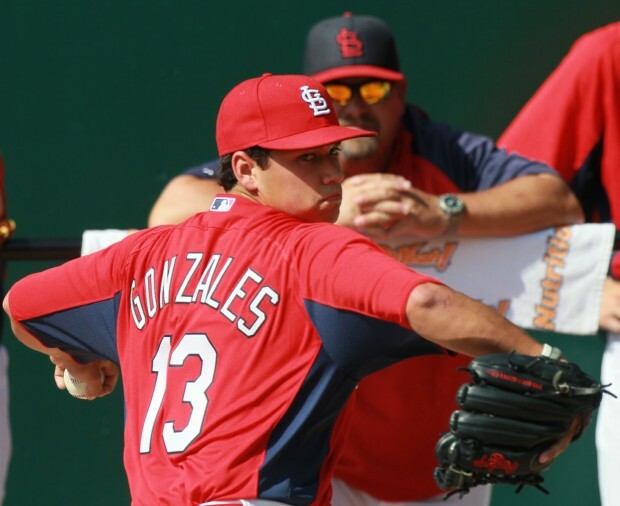 The St. Louis Cardinals have one of the best farm systems in all of baseball, and Marco Gonzales is one of the main reasons why. Just one year after being drafted, he has already ascended all the way up to third on Derrick Goold’s Top 7 prospects list. The former Gonzaga Bulldog is a left-handed starting pitcher who saw limited work in the minors after the draft–hoping to preserve his arm as much as possible. However, he ended the season at High-A Palm Beach–which is impressive considering it was just a few months after the draft. In 16.2 innings pitched for Palm Beach, he had a 1.62 ERA with 13 strikeouts, and opponents hit just .179 against him. I predict that he will move up the farm system ladder quite rapidly next season–mimicking the rise Michael Wacha had last season. Does this mean he will have his major league debut in 2014? Considering he will be on an innings limit once again, most likely not. However, you never know when it comes to pitchers–as we saw this past season when injuries happened and over 10 rookie pitchers made their debuts for the Cardinals. He main pitch is a fastball that ranges from 89-92 MPH. Like most lefties, he has a somewhat deceptive delivery and all four of his pitches have effective late movement.. Like Wacha, his go-to combination has been fastball-changeup with both pitches released from an almost identical arm slot. His breaking pitches need some polishing, but they have the makings of being effective pitches for him as well. Thus, he projects to be a three or four pitch pitcher with pinpoint control from the left-side. What’s not to like about that? However, for as good as Gonzales is as a pitcher, this is not why I like him as much as I do. Gonzales may be one of the best athletes in the entire organization. When he wasn’t pitching at Gonzaga, he played first base–where he was an effective hitter and above-average defender. In 2 years for the Bulldogs, he hit .310 with 20 doubles, two home runs, and 43 RBI. His fielding percentage was .984, and he showed range that will translate well over to his defense from the mound. Because of what I just documented above, I could realistically see him as a Gold Glove and Silver Slugger candidate year in and year out at the big league level. If you live in Palm Beach, Springfield, or Memphis, make sure to keep an eye on Gonzales next season because I do not think he will be at any of those stops for very long. He has a very bright future, and I am looking forward to seeing him pitch in Busch Stadium someday soon. Want a closer look at his minor league numbers and be able to keep up with him next season? Well, my buddy, John Nagel, of CardinalsFarm took the time to make player pages for the majority of Cardinal minor leaguers. Here is the link to Gonzales’ page as well as a link to the index of all the players’ pages. With the trade of David Freese to the Los Angeles Angels, the second base starting job appears to belong to Kolten Wong going into the 2014 season. Wait, for real?! But he hit just .153 and had an on-base percentage less than .200 last season! He struck out in nearly 20% of his plate appearances and had only one extra base hit! What are the Cardinals thinking? Trading away the hometown hero in order to free up space for a rookie that looked completely over-matched at the plate last season. Sheesh! To be blunt, judging Wong’s hitting performance during his short stint with the Cardinals last season is unfair. Completely unfair. 59 at-bats with 25% of them occurring in the pinch-hitting role is not enough to get a grasp of Wong’s ability at the plate. To be frank, Wong didn’t even have enough time to get used to big league pitching in so few at-bats with a good amount of them coming from off the bench. Thus, I will battle the small sample size argument many have against Wong with a small sample size rebuttal of my own. Hypocritical? Sure, but with 59 total major league at-bats to choose from, it is the best I can do at this time. Soon after his call-up, from August 18th through August 20th, Wong received three straight starts and performed quite well. To be honest, I don’t know why this performance didn’t merit more starts down the stretch. He had five hits in 14 at-bats (.357 batting average) with two runs scored and three stolen bases in as many attempts. Wong has hit at every level in his minor league career. Last year for Triple-A Memphis, Wong had 412 at-bats and hit .303 with 21 doubles, eight triples, 10 home runs, and 45 RBIs. Had had a solid .369 on-base percentage and was 20/21 on stolen bases. Wong’s average minor league season since being drafted two and a half years ago? .301 batting average with 24 doubles, seven triples, 10 home runs, and 50 RBIs. That’s a sign of quality bat that I cannot wait to see get regular plate appearances at the big league level. With Wong in the starting lineup, the team is better both on defense and on the base paths. Despite not being called up until mid-August, Wong was fifth on the team in stolen bases with three. He averaged 20 stolen bases per season in the minors which would have been 10 more than the highest on the Cardinals this season. Though Matt Carpenter performed admirably at second base this season, Wong is the better defender at the position. Unlike Carpenter, second is Wong’s natural defensive position. This past season, he was voted the best defensive second baseman in the Pacific Coast League (Triple-A)–an honor voted on by the managers. In the big leagues, his UZR/150 was 16.3 while Carpenter’s was -2.0. I know I made a case against small sample sizes earlier in this post, but I am a firm believer that a prospect’s glove carries over to the big leagues much more quickly than his bat, so this is a good sign. Also, by Wong taking over at second base, it can move Carpenter back over to his natural position of third base. Carpenter’s UZR/150 at third base is 4.7, while Freese’s was a dismal -4.8. Thus, by having Wong at second and Carpenter back at third, 2014’s infield defense is already much better than last year’s–to a tune of 27.8 UZR/150. This will be especially important due to the decline in defense with Jhonny Peralta at short instead of Pete Kozma. Finally, if you believe in projections (and I know a lot of people do not), Steamer of Fangraphs projects Wong to hit .269 with 26 doubles, five triples, eight home runs, 57 RBIs, and 16 stolen bases next season. This is a solid season for the rookie, and it shows the statisticians believe in his ability despite last season’s poor performance. In conclusion, will Wong have a breakout performance at the plate like Carpenter did in 2013? Probably not, but the combination of having Wong at second and Carpenter at third will make the Cardinals much better at the plate, in the field, and on the base paths than they were this season. I cannot wait to see more defensive plays like this gem from Game 3 of the World Series. For more updates, follow me on Twitter: @stlCupofJoe or check me out on Facebook: stlCupofJoe’s Sports Page. P.S. I just noticed that the great Bernie Miklasz published an article of his own on Wong just a couple hours before this one, but I want to assure you that I had this post in mind long before I saw that he wrote one.